Manufacturer of a wide range of products which include access tripod turnstile and tripod turnstile. 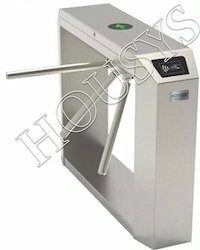 We offer the wide range of Access Tripod Turnstile. • Used for an extended variety of purposes like office buildings, research institutions, IT center, banks, airports. • Excellent design, with quality and durability. • Drop Arm function in case of power failure or emergency. • Auto-lift-arm function: the arm can lift automatically with an alert when the power is on again. We compete effectively in today's global business environment by constantly delivering cost competitive and high-quality Tripod Turnstile. Used for a wide variety of applications like office buildings, industrial sites, research institutions, IT center, banks, airports (e.g. automated boarding card checks), railway stations and sports stadiums. Excellent design, with quality and durability. High operation dependability with fast response. The whole system runs smoothly, low noise, no mechanical impact. Self-test function, when power on, system restoration automatic. Single directional or Bi-directional is selectable. Infrared sensor to prevent pinch pedestrians.